The Hellbound Hepcats are bringing back the sound of the 1950’s with an aggressive, big-beat twist-seamlessly fusing elements of Johnny Burnette, Chuck Berry and Brian Setzer with the pure energy of rockabilly. These hardworking rock’n'rollers combine the rawness and passion of the Sun Studio sessions with a harder, faster, more hip-shaking rhythm that is all their own. The Hellbound Hepcats’ music reflects the rebellious spirit of early rock n’ roll without imitating it. 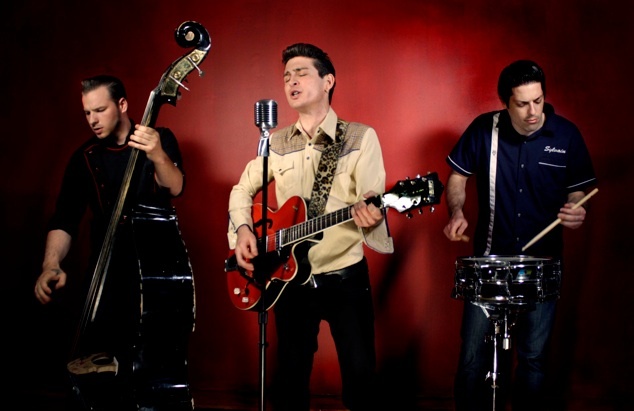 Their originality adds a much-needed new spin to the current rockabilly scene. The band started out in 2006 as a straight-up rockabilly/country duo, consisting of front man Alexander Brown and standup-bass player Jordan Peddie. Heavily influenced by Montreal’s ever-growing rockabilly scene, they soon became masters of their craft-playing in clubs and bars in and around Montreal. In 2007 the addition of drummer Sylvain Lemire rounded out the equation bringing in the pulsing rhythm section that has made the Hepcats the band they are today.